The Law of Attraction [“That which is like unto itself is drawn.”] makes itself pretty clear. However, based on the number of books, audio programs, classes, and blog posts like this one, the conscious use of it gets tricky. Just like the Law of Gravity and the Speed of Light, the Law of Attraction works all the time whether you’re conscious of it or not. I’ve noticed that when people try to use it consciously, they become like the centipede who tries to figure out which leg comes first! Over the next few weeks, I’m going to break it down in a series of posts, and the greatest part will focus on Step 3 – Receiving, where most people have the most trouble. 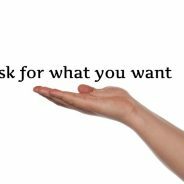 It’s simple, but it’s not oversimplifying the issue to remind you to ask for what you want. Stop and take the time to ask the Universe for exactly what you want. Remember that the Universe loves details and it wants to give you exactly what you want. So spend some time deciding what you want and then ask for it. You can do this any way that feels comfortable for you. You might write it in your journal or say it out loud or even perform a small ritual around asking if you want. Asking the Universe concretely and specifically sets your intention and lets the Universe know you are leaving nothing to chance. Thanks Sue worth a try.